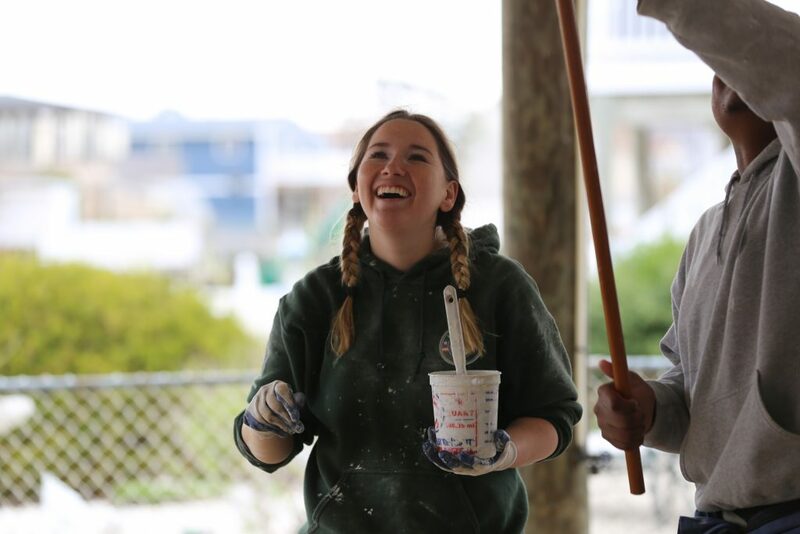 LITTLE EGG HARBOR – Lindsey Jesberg squinted through paint speckled goggles, dipping her brush to finish a stroke along the bottom of a home she had spent the last few weeks refurbishing. New Jersey was starting to grow on the California native who was sensing a bittersweet end to what had become a proud, impactful life experience. Jesberg was one of several volunteers, ages 18-24, from across the country who partnered with A Future With Hope through the AmeriCorps NCCC Atlantic Region over the month of April to help New Jersey residents with their future as they work on a future of their own. The civil society program supported by the U.S. federal government, foundations, corporations, and other donors engaging adults in public service work offers an educational award toward student loans or future schooling. Jordan Brown, an AmeriCorps team member from Roanoke, VA, was surprised that there was still so much going on nearly five years after Superstorm Sandy. “It’s been eye opening for me that disasters go a much longer way than we might anticipate,” he said, recognizing that he had encountered many vulnerable New Jersey home owners who had been cheated out of their money and taken advantage of in the hurricane’s tumultuous aftermath. The group laughed as they painted, having grown close over the month-long project despite being from different cities and states and coming from a vast variety of backgrounds. In spite of the storm’s devastation, the rebuilding effort was able to bring about meaningful friendships that would have never existed otherwise. “If I can just see one house through, I know that that’s someone else who gets to go back home,” Major radiated, rinsing her paintbrush. According to Jesberg, a common thread among her team was being humbled by the fact that so many families were in need of so much help. The group set down their tools and clamored together out front of the house for a final photo before packing up and heading back to their home states. In 2017, an estimated 3,000 families affected by Superstorm Sandy are still in the recovery process and need help building their homes. As one of the last recovery groups on the ground, A Future With Hope has rebuilt 256 homes and hosted more than 11,810 volunteers. All Saturdays through the summer are open for volunteer teams of 10-20 people to join ongoing projects in southern Ocean and Atlantic Counties including Little Egg Harbor, Atlantic City, and Brigantine. Give back this summer and organize a team to help bring families home. Visit www.afuturewithhope.org/volunteer to find out more and sign up to transform lives.